What follows is a blog post I originally made on another site of mine, years ago. I've modified it to suit Steel Challenge specifically. 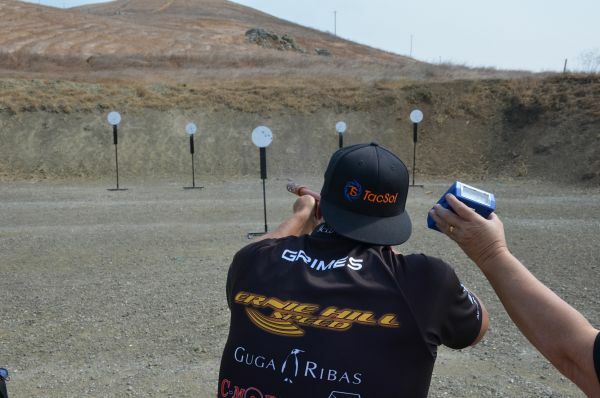 I highly recommend reading this article before showing up to your first match at the range! This is the place to start because you have to know where your gun and gear fit. 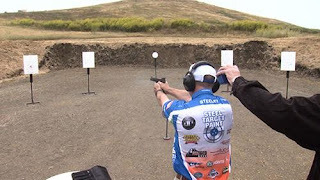 Most new shooters test the competitive waters with the gun they already have – and in most cases is the one they carry. I will post another article detailing the divisions. Most people will shoot in the Production division because it’s most closely aligned with what gear they have now. Now, this shooter was using a two-piece gun belt, but the principle stays the same. The idea is to make sure you have everything you’ll need when shooting. There’s also the basic safety needs, i.e. ear and eye protection. I'll note here that if you're shooting a rimfire pistol (.22LR) or an allowed long gun, these don't require holsters. They DO require bags or cases, or empty chamber flags must be inserted. Dress comfortably, and according to the weather. Bring sunscreen if you’re the type that’ll need it – remember you’re going to be standing out in the sun all day. While we’re talking about dressing, please leave the tactical gear, camo outfits, etc. at home. Same goes for T-shirts of the “Kill ’em all, let God sort ’em out” variety. 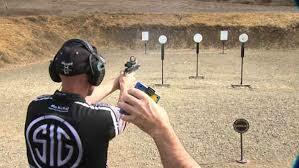 The USPSA is very image-conscious and we have to be. It hurts our sport AND our gun rights if the game we play is media-sensationalized into ‘militia training’. Also, bring water or Gatorade. Staying hydrated is important! There are rifle classes too - for rimfire (.22LR) and pistol-caliber carbines. A common mistake first-time competitors make is to arrive at the range with their gun holstered or already loaded. This is a big-time no-no. Why? Because USPSA ranges are cold ranges, meaning all weapons are unloaded and only handled under the direct supervision of a Range Officer. The only exception to this is when you’re at a designated Safe Area. It’s not that we don’t think you know how to safely handle a gun. The USPSA has an incredible safety record, and that is something we are very proud of and work very hard to maintain. Everyone follows the same safety procedures and it keeps us all safe. Please behave accordingly, because handing a gun when you’re not supposed to be is a ‘thanks for playing, now go home’ type of maneuver called a DQ (disqualification). Show up to the range with the gun in a bag or box. After you’re registered and it’s time to gear up, put on your belt/holster/etc and grab your gun IN THE BOX OR BAG and walk to a designated Safe Area. If it's a long gun that you're not holstering, it must stay in its case or have an empty chamber flag inserted. Once there, you can now handle your firearm. There IS a catch though… there’s one thing you CAN’T handle in a Safe Area. Any idea? It’s AMMO. The only time you can handle both is at the starting line, under the direction of the Range Officer. In the Safe Area you can holster, practice draws, etc. Once you’re ready, holster that blaster and head on back to the range. Your gun will stay holstered at all times, and will always have an empty mag well and be hammer down or striker-forward. When you’re not in the Safe Area you can handle your magazines, load them, etc. and put them on your belt. Remember to load your magazines according to the division rules. It looks like you’re ready to go shooting! When you’re not the shooter, stand well clear of the active shooter and the RO. Don’t make excessive noise (i.e. loud noises that may break the shooter’s concentration). Once the shooter has finished the stage the scorekeeper will record the hits, misses (mikes) and time. Make Ready This is the command to insert a mag, chamber a round, even take a sight picture if you like. Then holster the gun or lower to low-ready (about 45° down) and wait. Are you Ready? You don’t have to answer this one. If you’re NOT ready, then definitely say so, and loudly! If you answer yes, the RO will proceed. If you don’t answer at all, the RO will ASSUME you’re ready and proceed. BEEEEP! Holy cow, does that mean go? Yes, yes it does! When that buzzer sounds you’re off to the races. Draw or raise your gun and begin engaging targets according to the rules as laid out by the RO in the stage briefing. Good luck! If you are finished, unload and show clear. Note the *IF* statement. If you see a target you missed and decide to take a make-up shot, you can do so. Otherwise, drop the mag, retract the slide or bolt, and let the RO see that the chamber is empty. Range Clear It’s all over! You’ve completed your first course of fire under the clock. Some shooters really feel that adrenaline rush after a stage. I hope you enjoyed it! Other basic safety rules are always in effect, but a couple serious ones to mention: Never break the 180° imaginary line of the shooter and the bay. Basically, keep that weapon pointed downrange at all times. Pointing it back uprange is a DQ. Keep your shots aimed at the targets within the bay. Launching a round over the berm is a DQ as well. Ok, so I think that wraps it up! I hope this primer helps you prepare for your first Steel Challenge match, and I hope to see you at the range.